I have been using Adobe software recently and I noticed you could do simple calculations in textboxes. I used it to export Tile Images in different scale sizes. If the 100% scale of an Image is 150 pixels wide you can enter '150 * 1.5'. It will calculate the width of 225 pixels for the 150% scale size. I loved this feature so I tried to implement it also for my own Xaml apps. The solution is quite simple. I have created a Behavior called CalculatorBehavior. You just use Blend for Visual Studio to drop it on a TextBox control and you are done. The following video shows you how you can use it to do simpel calculations in a TextBox using the CalculatorBehavior. 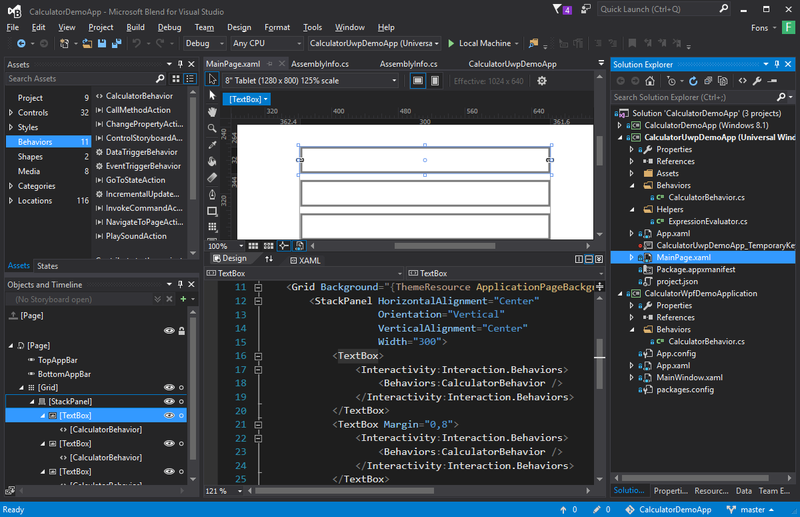 My Visual Studio solution contains 3 projects: Windows 10 (UWP), Windows 8.1 and WPF. The WPF project has a NuGet reference to Math Expression Evaluator. This project contains the ExpressionEvaluator class which I use for my calculations. There is no WinRT, PCL (Portable Class Library) or .NET Standard implementation for this project which makes it unusable for my Windows (8.1 and 10/UWP) projects. Luckily the project is Open Sources so I added the ExpressionEvaluator class to these projects. The Windows 10 project uses the XamlBehaviors project using the NuGet package. The Windows 8.1 project uses the 'Behaviors SDK' but that doesn't include a Behavior<T> class. So i added my own implementation for it in my project. The WPF project has a reference to the 'System.Windows.Interactivity' assembly. The CalculatorBehavior code is very simple. The class derives from Behavior<TextBox> which makes it droppable on a TextBox. The LostFocus event of the TextBox will trigger the calculation for which I use the ExpressionEvaluator. Adding the CalculatorBehavior to a TextBox is very easy in Blend for Visual Studio. Select the behavior from the Assets panel and Drag&Drop it on a TextBox. That's all. I have published my code on GitHub. I hope you like it. Op het TechDays 2016 event van Microsoft heb ik een sessie gepresenteerd met de titel 'Developing websites using ASP.NET MVC6 and Entity Framework Core 1.0'. Via deze blog wil ik de video en presentatie met u delen. The AnimatedTextBlock is an UserControl which contains a TextBlock and a Storyboard. The Storyboard contains a PlaneProjection.RotationX animation which rotates the TextBlock and a TextBlock.Text animation which sets the Text. The Font properties of the TextBlock like FontSize and FontFamily are inherited from the UserControl. In the code behind of the UserControl there is a Text dependency property which will allow Styling and DataBinding of this property. The OnTextPropertyChanged method is automatically called when the value of this property changes. In this method the value of the Text animation is set to the new value and the Storyboard is started. The class also contains a TextWrapping dependency property which is used in the XAML code to databind the TextBlock TextWrapping property to using compiled binding. For my solution I only needed this TextWrapping property but you might have to add extra properties like TextAlignment or TextLineBounds. In my sample page I have added a Button and an AnimatedTextBlock control to the root Grid of the Page. The AnimatedTextBlock is named 'atb1' so i can be used in the code behind of the page. The Button has a Click event which toggles the Text of the AnimatedTextBlock Text from Hello to World. I hope you can use this blog for your own Windows 10 apps. You can download the sample project below. Below you can find the slides of my What's new in Blend for Visual Studio 2015 presentation session at MADN on 23 september 2015. This meeting was sponsered by RealDolmen. In this session you will learn the new features of Blend for Visual Studio 2015. Blend is the XAML design and development tool for WPF, Silverlight, Windows Phone and Windows applications. You will also learn the new XAML controls and properties for developing Windows 10 applications. With this session you can improve your productivity and design skills. If you haven't installed Blend for Visual Studio 2015 yet make sure you do by downloading it from Developer Tool Downloads. My sample project is a simple Windows 10 Universal app which I created using Visual Studio 2015 RC. It contains a Page with a StackPanel with 4 buttons. The first button will be used to show a message dialog. The other buttons will be used to show content dialogs. The ButtonShowMessageDialog_Click method in the code behind of my page shows the message dialog. It creates an instance of the MessageDialog with the Text and the Title. UICommands are added to the Commands collection of the dialog. On Mobile you can only use 2 commands so there is a DeviceFamily check in the code to prevent the app from crashing. The DefaultCommandIndex is set to 0 which means that the first button will be invoked when you hit the Enter key. The CancelCommandIndex is set to 1 which means that the second button will be invoked when you hit the Escape key or the back button on the phone. You show the dialog using the ShowAsync() method which is awaited. The result contains the Id and the Label of the invoked command. // Adding a 3rd command will crash the app when running on Mobile !!! When you run the app on your computer and click/tap the first button you get a message dialog which is centered in the app window. The default button has a blue background which is the accent color of my computer. When you run the app on your Windows Phone and tap the first button you get a message dialog which is in the top of the screen. The dialog is dark because the phone has a dark theme setting. The labels of the buttons are always in lowercase. The ButtonShowContentDialog1_Click method in the code behind of my page shows the first content dialog. It creates an instance of the ConentDialog with the Title and MaxWidth. The MaxWidth property must be set to avoid problems with wide content on small devices. The Content of the dialog is set to StackPanel with the a TextBlock and a CheckBox. The IsChecked property is two-way databound to the IsPrimaryButtonEnabled property of the dialog. The Primary and Secondary buttons are initalized and use a Click event to set the result of the clicked button. If you use the Escape button or the back button on the phone the result will be set to NONE. You can only have one or two buttons. MaxWidth = this.ActualWidth // Required for Mobile! When you run the app on your computer and click/tap the second button you get a content dialog. The position of the dialog can differ depending the size of the app window. The OK button is only enabled when the checkbox is checked. When you run the app on your Windows Phone and tap the second button you get a content dialog which is always in the top of the screen. The ButtonShowContentDialog2_Click method in the code behind of my page uses Commands instead of Events to show the result of the content dialog. The PrimaryButtonCommand is a RelayCommand which has a CanExecute which returns true when the checkbox is checked. I expected that this would disable the primary button but it doesn't. You will still have to databind the checkbox to the IsPrimaryButtonEnabled property. I hope this will change in future versions. 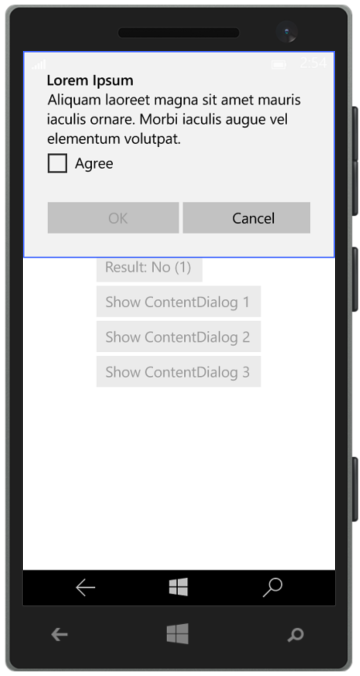 You can also use XAML instead of creating a content dialog from code. 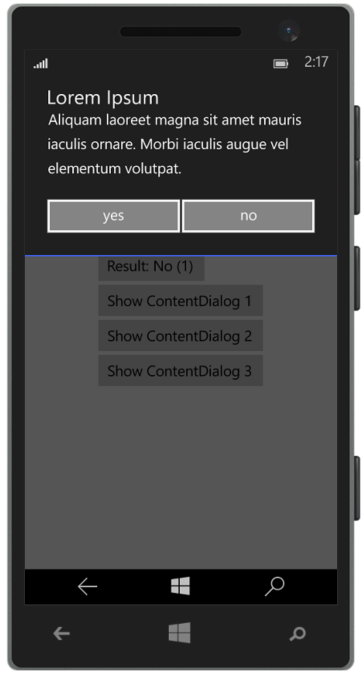 In the next example the ContentDialog is created in the MainPage.xaml and named MyContentDialog. The ButtonShowContentDialog3_Click method in the code behind will use this name to show the dialog and display the result. <TextBlock Text="Aliquam laoreet magna sit amet mauris iaculis ornare. Morbi iaculis augue vel elementum volutpat." Op de TechDays 2015 mochten we dit jaar maar liefst 3 sessies verzorgen. De 'Coding for Kids' sessie werd gepresenteerd door Franci van der Mijden en Fons Sonnemans. Hierbij werd duidelijk dat je kinderen kunt leren programmeren in plaats van ze alleen maar spelletjes te laten spelen. We hebben de verschillende programmeeromgevingen gedemonstreerd die er zijn om kinderen te leren programmeren. Met een opkomst van ruim 100 geïnteresseerden was de zaal volledig gevuld. Op veler verzoek kunt u de slides van deze presentatie hieronder bekijken. We believe the children are our future. Teach them well! Om een app in de Windows Store te kunnen zetten moet je eenmalig een Windows developer account aanmaken. Je hebt dan een developer-licentie. In Visual Studio – waarin je je app ook hebt gebouwd- kun je gemakkelijk je app in de Windows Store plaatsen. Fons is nogmaals bij Microsoft te gast om dit proces door te nemen. My demo app is a Windows app developed using the MVVM design pattern. It contains a MainPage (view), a MainViewModel (viewmodel) class and a Product (model) class. The MainViewModel has a Products property which is a list of 3 hard coded products. The MainPage has a ListView which ItemsSource is DataBound to the Products property of the MainViewModel. The ItemsTemplate of the ListView is set to the ProductsDataTemplate which is a static resource of the Page. This DataTemplate contains an Image control which has 2 events (PointerEntered and PointerExited). In this example I changed the Opacity of the image when you hover over it using your mouse. It is a silly implementation which could also have been implemented using Behaviors in Blend. The MainPage.xaml.cs file contains the MainPage class with the Image_PointerEntered and Image_PointerExited eventhandlers. They change the Opacity of the Image (sender). The MainViewModel.cs file contains the MainViewModel class which has the Products property. The Constructor adds 3 sample products to the List. The Product.cs file contains the Product class with the Name, Price and ImageUrl properties. Now you can add a ResourceDictionary to the project. Created a folder Resources in the root of the Project in which you will add the ResourceDictionary file. Create this file in Blend and not in Visual Studio because Blend will add the MergedDictionary code to my App.xaml. I named my file MyDataTemplates.xaml. 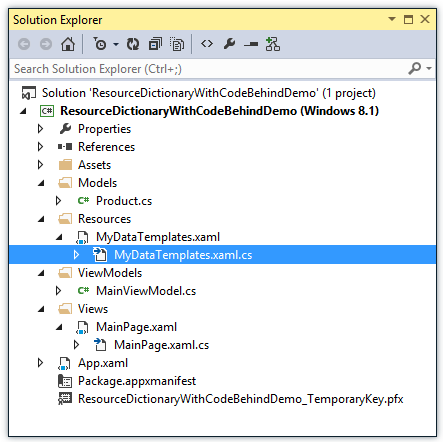 MyDataTemplates.xaml will look like this. Blend will also add the ResourceDictionary to the MergedDictionary of your Application in the App.xaml. 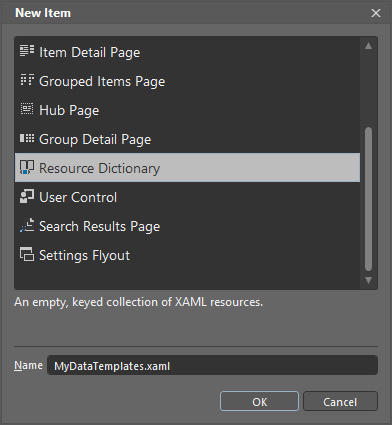 Now you must add an x:Class attribute to the ResourceDictionary element in the MyDataTemplates.xaml file. This attribute points to the ResourceDictionaryWithCodeBehindDemo.Resources.MyDataTemplate class. Next you can move the ProductDataTemplate from the MainPage to the ResourceDictionary. The MyDataTemplate class must be a partial class. You must also add a constructor (use the ctor snippet) to the class and call InitializeComponent(). This InitializeComponent method will be automatically generated if you set the x:Class attribute in the XAML. Finally you can move the eventhandlers from the MainPage to the MyDataTemplates class. 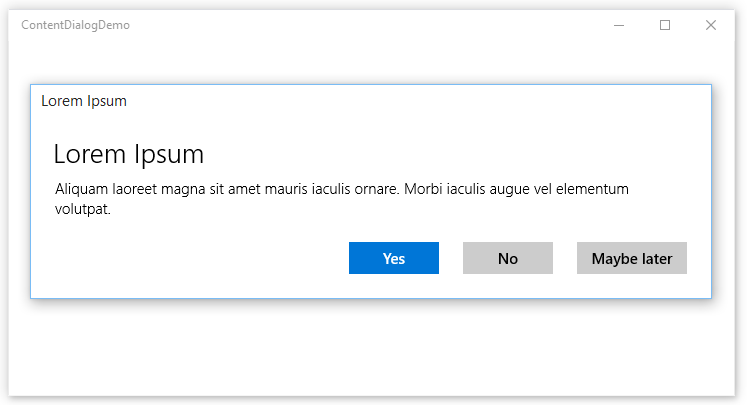 The App.xaml must also be changed. You will have to register an extra xml namespace named res which holds the 'using:ResourceDictionaryWithCodeBehindDemo.Resources' value. In the MergedDictionaries element you must remove the MyDataTemplates ResourceDictionary and add an <res:MyDataTemplates /> element. This will instantiate an instance of the CodeBehind class. The constructor of the class will load the XAML in the InitializeComponent() method. The MainPage.xaml now doesn't have the ProductsDataTemplate. MainPage.xaml.cs now only contains the constructor. I hope you like my solution it will open up a lot of extra possibilities to structure your XAML projects. You can download the sample project below.